Below is a bibliography of medieval scrolls written in Greek. Here you will find full bibliographic information, expanding on the short citations found within each individual scroll record. For bibliographic information on Latin scrolls, please click here. (Windows: CTRL + F; Mac: command + F). 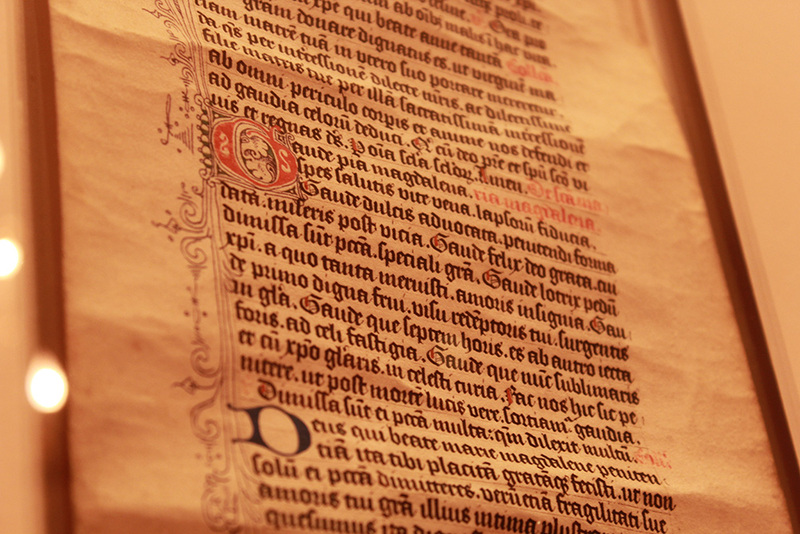 The goal of this bibliography is to serve as a complete resource of information on Medieval scrolls. If you are aware of a source not contained within our collection please contact us at contact@medievalscrolls.com. Alexander, P.J. “A Chrysobull of the Emperor Andronicus II Paleologus in Favor of the See of Kanina in Albania.” Byzantion, 15 (1940-1941), 167-207. Aemidius Martini and Dominicus Bassi, Catalogus codicum graecorum Bibliothecae ambrosianae. 2 vols. Milan: Hoepli, 1906. 1151, no. 1090. Bond, W. H., and Christopher Urdahl Faye. Supplement to the Census of Medieval and Renaissance Manuscripts in the United States and Canada. New York: Bibliographical Society of America, 1962, 344. Bréhier, Louis. “Les peintures du rouleau liturgique no. 2 du monastère de Lavra,” Annales de l’Isnstitut Kondakov (Seminarium Kondakovianum), II (1940), 1-20 plus 4 plates. Brightman, F.E. Liturgies Eastern and Western, Oxford 1896, p. xc. Buckton, David, ed. Byzantium: Treasures of Byzantine Art and Culture from British Collections. London: British Museum Press, 1995, 178. Catalogue of Additions to the Manuscripts in the British Museum, 1876-1881, London 1882. Cavallo, Guglielmo. “La genesi dei rotoli liturgici beneventani alla luce del fenomeno storico-libraio in Occidente ed Oriente:” in Miscellanea in memoria di Giorgio Cencetti. Milan: Bottega d’Erasmo, 1972. Pp. 213-229 plus 4 plates. Charles Astruc and Marie-Louise Concasty. Bibliothèque nationale, département des manuscrits. Catalogue des manuscrits grecs. Troisième partie: le supplement grec. Tome III: Nos. 901-1371. Paris: Bibliothèque nationale, 1960. Coxe, Henry O. Catalogi codicum manuscriptorum bibliothecæ Bodleianæ pars tertia, codices Græcos et Latinos Canonicianos complectens. Oxford: Bodleian Library, 1854, cols. 579-80. Cuming, Geoffrey J. The Liturgy of St. Mark. Orientalia christiana analecta, 234. Rome: Pontifificium Institutum Studiorum Orientalium, 1990. Daly, Lloyd W. “‘Rotulus Beratinus’, a Greek Liturgy Roll.” Greek, Roman and Byzantine Studies 13, no. 1 (Spring 1972): 109–119. De Meyier, K.A. Bibliotheca Universitatis Leidensis Codices manuscripti VI. Codices Vossiani graci et miscellanei. Leiden: Bibliotheca Universitatis, 1955. pp. 277-8. Evans, Helen C. and Wixom, William D. eds. The Glory of Byzantium: Art and Culture of the Middle Byzantine Era A.D. 843-1261. New York: Metropolitan Museum of Art, 1997. Farmakovskij, B. V. “Byzantine Parchment Manuscript Rolls with Miniatures.” Izvestija Russkago Arkheologiceskago Instituta v Konstantinopole VI (1901): 253–359. pl. I-III. Fenwick, J.R.K. The anaphoras of St. Basil and St. James: an investigation into their common origin, Rome 1992. Grabar, Andre. “Un rouleau liturgique constantinopolitain et ses peintures”, Dumbarton Oaks Papers 8 (1954): 163-199. Gardthausen, Viktor Emil. Catalogus codicum Graecorum Sinaiticorum. Oxonii: E Typographeo Clarendoniano. 1886. Hunger, H., Hannick, C. Katalog der griechischen Handschriften der Österreichischen Nationalbibliothek, Teil 4: Supplementum graecum (Museion NF IV, 1, 4), Wien 1994. Illuminated Greek manuscripts from American collections: an exhibition in honor of Kurt Weitzmann/Gary Vikan. Princeton: Art Museum, Princeton University, 1973. Ιδρυμα ορους Σινα. Τα Νεα Ευρηματα Του Σινα. Athens: Υπουργείο Πολιτισμού Σινα. 1998. Jacopi, Giulio. “Le miniature dei codici di Patmo.” Clara Rhodos. (1932/3) 583. Lambros, Spyridon P. Catalogue of the Greek Manuscripts on Mount Athos. 2 vols. Amsterdam: Adolf M. Hakkert, 1966. Lampake, Georgias. “Periegeseis,” Deltion tes Christianikes Archaiologikes Etaireias, 8, 1908, 56. Lowden, John. “Liturgy and Luxury: The Function of Books.” in Church and People in Byzantium. Edited by Rosemary Morris. Birmingham: Centre for Byzantine, Ottoman and Modern Greek studies, University of Birmingham. 1990. Mancini, Augustus. Codices graeci monasterii messanensis s. Salvatoris. Messina: D’Amico, 1907. 242-3. Omont, Henri. Inventaire sommaire des manuscrits grecs de la Bibliothèque nationale. 3 vols, Paris, Alphonse Picard, 1886, 1888. Introduction et tables, Paris: Ernest Leroux, 1898. Papadopoulos-Kerameus, Athanasios. Hierosolymitikē Vivliothēkē, ētoi Katalogos tōn en tais vivliothēkais: tou hagiōtatou apostolikou te kai katholikou orthodoxou patriarchikou thronou tōn Hierosolymōn kai pasēs Palaistinēs apokeimenōn Hellēnikōn Kōdikōn, 5 v. in 6. St. Petersburg, V. Kirspaoum, 1891-1915. Parkes, Malcom B. The Medieval Manuscripts of Keble College Oxford. London: Scholar Press. 1979, 333. Peers, Glenn. “Art and Identity in an Amulet Roll from Fourteenth-Century Trebizond.” Church History and Religious Culture 89 (2009): 153–78. Polites, Linos. Symplērōmatikoi katalogoi cheirographōn Hagiou Orous. Thessalonikē: Hetaireia Makedonikōn Spoudōn, 1973. Ragusa, I., “The iconography of the Abgar Cycle in Paris, MS Lat. 2688 and its relationship to Byzantine cycles.” Miniatura II (1989), p. 35-51, figure 4-48. Revilla, A. Catálogo de los códices griegos de la biblioteca de El Escorial. Madrid: Imprenta Helénica. 1936. Richard, Marcel. Inventaire Des Manuscrits Grecs Du British Museum. Publications de l’Institut de Recherche et D’histoire des Textes 3. Paris: CNRS, 1952. Ruiz García, Elisa. Catálogo de la sección de códices de la Real Academia de la Historia. Madrid: Real Academia de la Historia, 1997, cod. 84. Santifaller, “Über späte Papyrusrollen und frühe Pergamentrollen,” in Clemens, Bauer, Laetitia Boehm, and Max Müller, eds. Speculum historiole: Geschichte im Spiegel von Geschichtsschreibung und Geschichtsdeutung. Freiburg/Munich: Karl Alber, 1965, 117-35. Skemer, Don C. Binding Words: Textual Amulets in the Middle Ages. Magic in History. University Park, PA: Pennsylvania State University Press, 2006, 199-215. Swainson, C.A. The Greek Liturgies, Chiefly from Original Authorities. Cambridge: Cambridge University Press, 1884. Taft, Robert F. The Great Entrance: A history of the transfer of gifts and other pre-anaphoral rites. Rome: Pontificium Institutum Studiorum Orientalium. 1978, 435-446. Turyn, Alexander. Codices Graeci Vaticani Saeculis XIII et XIV Scripti Annorumque Notis Instructi. Biblioteca vaticana: 1964. pp. 23-5.
von Muralt, Eduard. Catalogue des manuscrits grecs de la Bibliothèque impériale publique. St. Petersburg: Imprimerie de l’Académie impériale des sciences. 1864. Wessely, Karl. “Eine Pergamenrolle des VI. Jahrhunderts,” Wiener Studien 4 (1882), 214-223. Δημήτριος Ζ. Σοφιανός καὶ Φώτιος Ἀρ. Δημητρακόπουλος, Τὰ χειρόγραφα τῆς Μονῆς Δουσίκου Ἁγίου Βησσαρίωνος: Κατάλογος περιγραφικός (Athens, 2004), 207–9 and pls.113 and 114. Χρυσοστομικά. Studi e ricerche intorno a s. Giovanni Crisostomo a cura del comitato per il xvo centenario della sua morte, Rome 1908, 272.